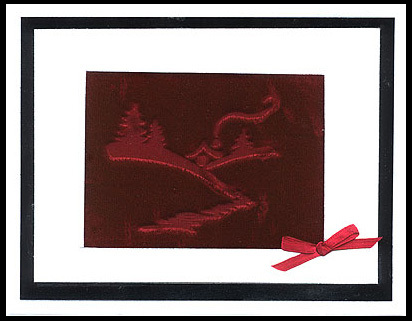 “Winter Cabin” is embossed with an iron on wine velvet and framed in white sparkle, black and silver card stock layered to form a frame. The inside and outside edges of the white card stock are embellished with a silver Krylon Leafing pen. A bow is added for accent. The scan does not do the card justice because of the very dark velvet. Card by Margaret Wiggin.